1. the lowest part or foundation of anything. See also basis. 2. the main ingredient of a compound. 3. the nonacid part of a salt; a substance that combines with acids to form salts. In the chemical processes of the body, bases are essential to the maintenance of a normal acid-base balance. Excessive concentration of bases in the body fluids leads to alkalosis. 4. a unit of a removable dental prosthesis. 5. in genetics, a nucleotide, particularly one in a nucleic acid sequence. intermediary base the layer of cement between a dental restoration and the tooth structure, acting as an insulator and protective barrier. nitrogenous base an aromatic, nitrogen-containing molecule that serves as a proton acceptor, e.g., purine or pyrimidine. ointment base a vehicle for the medicinal substances carried in an ointment. purine b's a group of compounds of which purine is the base, including uric acid, adenine, xanthine, and theobromine. Bases. A, Purine and some substituted purine bases occurring in nucleic acids. B, Pyrimidine and some substituted pyrimidine bases occurring in nucleic acids. From Dorland's, 2000.
pyrimidine b's a group of chemical compounds of which pyrimidine is the base, including uracil, thymine, and cytosine, which are common constituents of nucleic acids. 1. The lower part or bottom; the part of a pyramidal or conic structure opposite the apex (for example, heart); the foundation. 2. pharmacy the chief ingredient of a mixture. See also: Brønsted base, Lewis base. 3. chemistry an electropositive element (cation) that unites with an anion to form a salt; a compound ionizing to yield hydroxyl ion. 4. Nitrogen-containing organic compounds (for example, purines, pyrimidines, amines, alkaloids, and ptomaines) that act as Brønsted bases. 5. Cations, or substances forming cations. 6. A substance the pH of which is over 7.0, in contrast to an acid. 1. the lowest part or foundation of anything; see also basis. 3. in chemistry, a substance that combines with acids to form salts; a substance that dissociates to give hydroxide ions in aqueous solutions; a substance whose molecule or ion can combine with a proton (hydrogen ion); a substance capable of donating a pair of electrons (to an acid) for the formation of a coordinate covalent bond. buffer base the sum of all the buffer anions in the blood, used as an index of the degree of metabolic disturbance in the acid-base balance. denture base the material in which the teeth of a denture are set and which rests on the supporting tissues when the denture is in place in the mouth. purine bases a group of chemical compounds of which purine is the base, including adenine, guanine, hypoxanthine, theobromine, uric acid, and xanthine. pyrimidine bases a group of chemical compounds of which pyrimidine is the base, including uracil, thymine, and cytosine. temporary base , trial base baseplate. a. The part of a plant or animal organ that is nearest to its point of attachment. b. The point of attachment of such an organ. a. Any of a class of compounds whose aqueous solutions are characterized by a bitter taste, a slippery feel, the ability to turn litmus blue, and the ability to react with acids to form salts. b. A substance that yields hydroxide ions when dissolved in water. c. A substance that can act as a proton acceptor. d. A substance that can donate a pair of electrons to form a covalent bond. 3. One of the nitrogen-containing purines (adenine and guanine) or pyrimidines (cytosine, thymine, and uracil) that occurs attached to the sugar component of DNA or RNA. 1 a chemical compound that increases the concentration of hydroxide ions in aqueous solution. See also acid,alkali. 2 a molecule or radical that takes up or accepts hydrogen ions. 3 an electron pair donor. 4 the major ingredient of a compounded material, particularly one that is used as a medication. Petroleum jelly is frequently used as a base for ointments. 5 (in radiology) the rigid but flexible foundation of a sheet of x-ray film. The base is essentially transparent but is given a bluish tint during manufacture to reduce eyestrain of the radiologist viewing x-ray films. The bottom of a conical or pyramidal structure—basis TA, basement. (1) An electropositive substance which combines with an acid to form a salt. (2) A substance that dissociates to give H+ ions in aqueous solutions; chemical substance that ionises in water to release hydroxyl ions (OH-) or other ions that combine with hydrogen ions. (3) A substance which can combine with a protons/H+ ions. A regional street term for freebase cocaine; crack. The core active ingredient of a therapeutic agent. The lowest part, bottom or fundamental part of structure. 1. The lower part or bottom; the part of a pyramidal or conic structure opposite the apex; the foundation. 4. Nitrogen-containing organic compounds (e.g., purines, pyrimidines, amines, alkaloids, ptomaines) that act as Br̷ønsted bases. 5. A substance with a pH over 7.0, in contrast to an acid. A chemical compound that combines with an acid to form a salt and water. A term applied in genetics to one of the four nitrogenous bases of DNA and RNA. In DNA the bases are adenine, thymine, guanine and cytosine. Guanine and adenine are purines and cytosine and thymine are pyrimidines. In RNA, the pyrimidine base uracil replaces thymine. (See also BASE PAIR). a chemical substance which has a tendency to accept protons (H+); the base dissolves in water with the production of hydroxyl ions and reacts with acids to form salts. one of the PURINE or PYRIMIDINE components of NUCLEOTIDES. n 1. a compound that can react with an acid in aqueous solutions to form salts. 2. in aromatherapy, an ingredient specifically prepared to represent a particular natural fragrance source, a blend of natural sources of fragrance sources, or an abstract fragrance concept. 1. The lower part or bottom; the part of a pyramidal or conic structure opposite the apex (e.g., heart); the foundation. 3. A substance with a pH over 7.0, in contrast to an acid. n 1. the foundation or support on which something rests; the point of attachment of a part; the principal ingredient of a material. n 2. a compound that yields hydroxyl ions in water solution and causes neutralization of acid to form a salt and water. 3. the part of a denture that supports the prosthetic teeth and receives support from the oral mucosa, anchoring teeth, or alveolar ridge. See also basic. Opposite: acid. n a denture base made of an acrylic resin. n the portion of the jawbone that gives support to the teeth. n a layer of insulated, sometimes medicated dental cement placed in the deep portions of a cavity preparation to protect the pulp, reduce the bulk of the metallic restoration, or eliminate undercuts in a tapered preparation. n 1. the part of a denture that fits the oral mucosa of the basal seat, restores the normal contours of the soft tissues of the dentulous oral cavity, and supports the artificial teeth. n 2. the portion of a denture that overlies the soft tissue, usually fabricated of resin or combinations of resins and metal. n a unit of a removable prosthesis that extends anteriorly or posteriorly, terminating without end support by a natural tooth. n a thin, flexible, transparent sheet of cellulose acetate or similar material. n the body of the mandible, on which the teeth and alveolar tissues are situated. n a substance from which a denture base may be made (e.g., acrylic resin, vulcanite, polystyrene resin, and metal). n the basal surface of a denture constructed of metal (e.g., aluminum, gold, and cobalt-chromium) to which the teeth are attached. n a denture base, baseplate, or record base made of a plastic material. n a resinous material adapted to maxillary or mandibular casts to form baseplates. n a denture base that simulates the coloring and shading of natural oral tissues. 3. a molecule or ion with a tendency to take up a proton according to Bronsted and Lowry theory; a substance that combines with acids to form salts. In the chemical processes of the body, bases are essential to the maintenance of a normal acid-base balance. Excessive concentration of bases in the body fluids leads to alkalosis. See also basal. 4. the primary entity against which all other entities are compared. 5. the non-sugar components of nucleotides in DNA and RNA. the two molecules forming the matching acid and conjugate base. refers to the relative components of a nucleic acid. the anion or uncharged molecule of an acid once it has given up its proton, e.g. Cl− is the conjugate base of the acid, HCl. the amount of acid or base required to titrate a sample of whole arterial blood to the normal pH of 7.4. The base excess is determined mathematically by calculations that include measurement of the blood Pco2 and pH and take into account the hemoglobin level. It is negative (base deficit) in acidosis and positive in alkalosis. the wide dorsal part of the heart carrying the atria and the large blood vessels and the attachment to the pericardial sac. the widest part of the horn, at its attachment to the skin. In the adult horned animal the horn is hollow at this point, encloses the horn process of the frontal bone and merges with the skin. This is covered with a thin layer of horn similar to the periople of the hoof, called the epiceras. a mandible which is narrow relative to the maxilla; often causes the lower canine teeth to strike the hard palate. See also anisognathism. an aromatic, nitrogen-containing molecule that serves as a proton acceptor, e.g. purine or pyrimidine. faces cranially and to the left where it is attached to the reticulum and the abomasum at the reticulo-omasal and omasoabomasal orifices. two hydrogen bonded nucleotides in a DNA or RNA molecule. 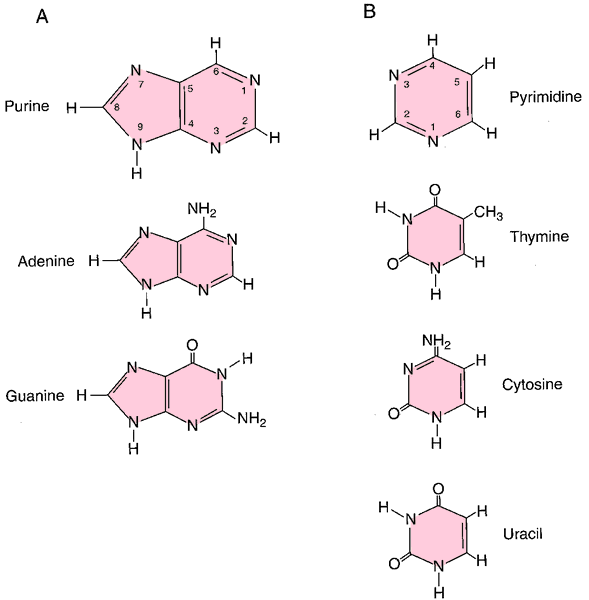 a group of compounds of which purine is the base, including uric acid, adenine, guanine, xanthine and theobromine. a group of chemical compounds of which pyrimidine is the base, including uracil, thymine and cytosine, which are common constituents of nucleic acids. the footplate of the stapes in the middle ear from which the two legs originate. The stapes lies horizontally with the base facing medially and attached to the vestibular window by the annular ligament. Q. i am diabetic :( what is the right diet for me? should i avoid sugar based products? what is the amount of sugar in the blood that consider to be normal ? Q. where is the greatest data base of Fibromyalgia over the net? do someone know the address ? will i find all my answers there ? is it like here where you can chat with other patient ? Q. Is good Nutrition is the base of a good and healthy life? A. good nutrition will not solve all your health problems in life, you can still have infections and other health problems but it will reduce the amount of it in dramatic way.